Yanping He is a Marine Environmental Observation Prediction and Response Network (MEOPAR) funded research associate working on developing statistical models that link surface maximum winds with power outage for future trend estimation in coastal BC. She gained her PhD and MS degree in the fields of climate dynamics and modeling. Her previous research associate and postdoctoral work focused on developing, testing, and implementing a new boundary layer turbulence scheme in the fourth generation of the Canadian Atmospheric Global Climate Model (CanAM4) and evaluating the representation of wind speed Probability Density Functions (PDFs) and the potential wind energy distribution at the local-to-regional scale using the Canadian Regional Climate Model and global weather station data analysis. She is a reviewer of the Journal of Climate, Journal of Geophysics Research, Climate Dynamics, Geoscientific Model Development, et al. 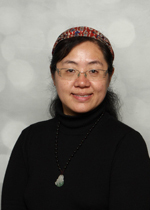 Her expertise and current interests include surface winds, climate modeling (statistical and dynamical) and analysis, evaluating future projections and climate impacts. Monahan A. M.; T. Rees; Y. He; N. McFarlane (2015), Multiple Regimes of Wind, Stratification, and Turbulence in the Stable Boundary Layer. Journal of the Atmospheric Sciences, Vol. 72, 3178-3198. He Y., A. H. Monahan, and N. McFarlane (2013), Diurnal variations of land surface wind speed probability distributions under clear sky and low cloud conditions, Geophysical Research Letters, Vol 40, 1-7, doi:10.1002. He Y., N. McFarlane, and A. H. Monahan (2012), The influence of boundary layer processes on the diurnal variation of the climatological near-surface wind speed probability distribution over land, Journal of Climate, 25, 6441-6458. Monahan A. M., Y. He, N. McFarlane, and A. Dai (2011), The probability distribution of global land surface wind speed, Journal of Climate, Vol 24, 3892-3909. Nathan R., N. Horvitz, Y. He, A. Kuparinen, F. M. Schurr, and G. Katul (2011), Spread of North American wind dispersed trees in future enviroments, Ecology Letter, Vol. 15, No.3, 211-219 ("must read" ranked by Faculty of 1000 ) . He Y., A. H. Monahan, C. G. Jones, A. Dai, S. Biner, D. Caya, and K. Winger (2010), The probability distribution of land surface wind speed over North America, JGR-Atmosphere, Vol. 115, D04103, doi:10,1029/2008JD010708. He Y. (2009), How surface latent heat flux is linked to lower tropospheric stability in Southern Marine Stratus and Stratocumulus Regions, Cent. Eur. J. Geosci., Vol 1, No.3, 368-375. He Y. (2009), Surface wind speed probability distribution in the Southeast Pacific of marine stratus and stratocumulus regions, Cent. Eur. J. Geosci., Vol.1, No. 4., 443-456. Zeng, X, and Y. He, 2001: Surface evaporation at very high sea surface temperatures. In monograph: Dynamics of Atmospheric and Oceanic Circulation and Climate. China Meteorological Press, 508-520. Zeng X., Ming Zhao, R. Dickinson, and Y. He (1999), A multiyear hourly sea surface skin temperature data set derived from the TOGA TAOA bulk temperature and wind speed over the tropical Pacific, JGR-ocean, Vol. 104, No. C1, P1525-1536. He Y., N. McFarlane, A. H. Monahan, and J. Scinocca, 2017, “Representing The Atmospheric Boundary Layer in the CanAm4 Model of the Canadian Centre for Climate Modeling and Analysis (CCCma)”, Invited talk, TUDelft , Delft, Netherlands. He Y., N. McFarlane, A. H. Monahan, and J. Scinocca, 2017, “Understanding and Representing Stable Boundary Layer Over Cold Regions Based on Observations and A New Diagnostic Turbulence Scheme in CanAm4 Climate Models”, EGU 2017 Annual meeting, April, Vienna, Austria. He Y., N. McFarlane, A. H. Monahan, and J. Scinocca, 2016, "New TKE Based Turbulent Transfer Scheme in the CCCma Models", CNRCWP 2016 Annual Meeting, Montreal, , QC, Canada. He Y., N. McFarlane, and A. H. Monahan 2014, "A New Diagnostic Turbulence Parameterization Scheme for Representing Diurnal Variations of the Boundary Layer Wind Speed PDF in CANAM4 SCM", CMOS 2014 Annual Meeting, Rimouski, QC, Canada. He Y., A. H. Monahan, and N. McFarlane, 2014, Simulating Diurnal Variations of Boundary Layer Winds, Temperature, and Humidity using the New Diagnosed Turbulence Parametrization Scheme in CAM-SCM", CNRCWP 2014 Annual Science Meeting, Montreal, QC, Canada. He Y., A. H. Monahan, and N. McFarlane, 2013, Diurnal variation of near-surface wind speed probability distribution under clear and cloudy sky, AMS 2013 Annual meeting, Austin, Texas, USA. He Y. and N. McFarlane 2010, SCM15F TKE verison Improvements, Cloud-Aerosol Feedback and Climate (CAFC) Network Annual Meeting, , Toronto, ON, Canada. He Y., A. H. Monahan, C. G. Jones, A. Dai, S. Biner, D. Caya, and K. Winger, 2008, Land surface wind probability distributions in North America: observations, theory, and regional climate model evaluations, CRCMD Annual Meeting, I'Esterel, QC,Canada. He Y. and R. E. Dickinson, 2006, Influence of cloud heterogeneity on stochastic dynamics of ocean surface wind over subtropical marine stratus and stratocumulus regions. AGU 2006 Annual Meeting, Section OS27. He Y. and R. E. Dickinson, 2006. A simple conceptual model of atmospheric stability and marine stratus and stratocumulus cloud fraction, 18th conference on climate variability and climate change, 9.11, 86th AMS annual meeting , Atlanta, GA.
Fyffe G., J. Horton, and Y. He, 2001, Experiments with MARMOSET, a Deduction System Based on Clause Trees, Proceedings of the Second International Workshop on the Implementation of Logics, German. He Y., X. Zeng, and R.E, Dickinson, 1999: Diurnal Variation of Temperature and Surface Fluxes over the Tropical Pacific, COARE-98, Proceedings of a conference on the TOGA Coupled Ocean-Atmosphere Response Experiment (COARE), 328-329.